Dani Vilaró, horse riding intructor MANEL LLADÓ. Dani Vilaró has had a love for animals, and in particular horses, all his life. So it only seemed natural for him to open the Poni Club Girona in July 2014, after decades involved in the professional world of horse riding, and especially personal development and therapies for children, as well as equestrian tourism. 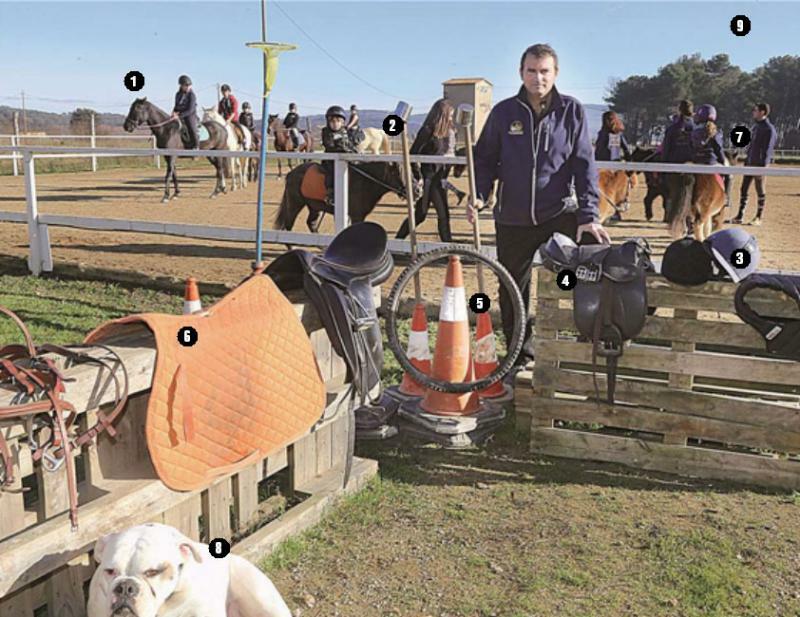 Dani is the driving force behind the Poni Club Girona, with the aim of providing quality instruction for all ages, allowing his customers to enjoy wonderful riding experiences while giving them the chance to enjoy contact with animals in the open air. “More and more people are becoming passionate about this sport, which in Catalonia is well ahead of the rest of Spain, but behind the rest of Europe, as for too many years it was in the hands of the military and rich people, which has made its progress difficult. Now though, there are lots of influences from abroad. Still, many people don’t even consider it a sport, when in fact it’s a very complete one, helping you work many muscles and parts of the body you wouldn’t normally use,” says Dani. 1.Ponies and horses: we offer activities for ages 2 to 16 years old. The small ponies embody the club’s main concept: Poni Games, starting from 2 to 3 years old, providing the base for future riders. 2. Poni Games: our main new activity, which is based on riding games, is focused on three concepts: team work, sharing and learning through games. The hour-long Poni Play consists of a circuit and a workshop, where children are accompanied by parents. Children get a chance to handle, embrace, groom, brush and saddle the horses, under the watchful supervision of an instructor, for a safe, bonding experience. The parents get explanations of the rules and how ponies behave, which is basic, as they will be in charge of taking the ponies through an interactive circuit. The activity is every Sunday and holidays from 10am to 2pm during term time. 3. Helmets and body protectors: to protect the head and back. Safety and comfort for both the horse and rider are essential. We need to be cautious and ride horses of the right size. 4. Saddles, bridles and safety stirrups: equipment used for riding needs to be cleaned and left in good order, that’s fundamental. 5. Wheel and cones: used for the Poni Games. 6. Saddle blanket: used for keeping the horses warm and dry in winter and to protect them from injuries. Horses need to be groomed carefully, using tools like hoof picks, curry and mane combs, and body brushes. 7. Our team: a good group of well-trained young instructors who work hand-in-hand and love horses. We also do coaching with horses. Horse riding has benefits for both emptional stability and good physical condition. Contact with horses helps people: they are not judgemental, are very sensitive and receptive and act like a mirror, capturing your emotional state, showing you your internal conflict, and helping you resolve it. Many have managed to solve their problems without coaching, the horse is the therapist. 8. La Brida: our dog. All animals interact with the children, we have a few dogs and hens, each has its own role in sharing experiences in the open air. 9. The good location: having a place that’s easy to get to with free parking is key. We are located near Girona, 10 to 15 minutes by car from city centre.